Here is a recent interview I did with fellow fitness colleague Josh Hillis. Josh: Ok, so lets say a guy just finished my Fighter Workouts for Fat Loss program – he’s lost a ton of fat, he’s wicked rockstar lean, and he’s definitely added some muscle, but now he wants some weight gain tips to get huge and jacked and start a serious muscle gain program. Where does he start from a nutrition stand point? Guys with average genetics can build up to 3-4 pounds of lean muscle mass each month, which is safe weight gain, anything more will typically be fat. 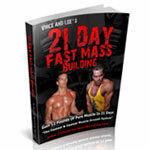 This allows ultra, ultra skinny guys some room to gain some fat that will be hardly noticeable. Here are some more tips to gain weight from a nutrition standpoint: Uultra skinny guys should take their body weight and multiply it by 18 and that is there goal calories each day. If you’re around 13-15% fat then take your body weight and multiple it by 15 to determine your goal calories. To maximize the muscle:fat ratio I recommend to always eat clean and maintain a “fat loss” mentality when choosing foods. Stick to primarily oats, whole wheat bread, pasta, rice, potatoes, fruits and veggies for muscle fuel. Stick to lean cuts of beef, fish and chicken for muscle growth. Balance out your meals with olive oil, fish oils, mixed nuts or natural peanut butter which are my staples. Even the best bodybuilding supplements will be redundant if you stick to the foods above with a 50/35/25 breakdown (carbs/proteins/fats) so max out your results with real food before you consider any supplements. Josh: What do you think is the biggest mistake most people make when they start their first weight gain program to build muscle? Vince: They don’t finish it! Most guys just don’t give a program enough time to work. It takes years for your muscles to become hard, dense and thick (unless you’re on drugs or have amazing genetics). Sure, you can increase the size of your body but to really look impressive you need to be consistent year in and year out and just focus on small, incremental progress. Your weights should be going from the low end of the dumbell rack to the high end. You should be getting more work down in less time and your overall work capacity should be higher each year. Most guys try my program for a few weeks and then try another guys program a few weeks which prevents them from making any significant improvements in strength and conditioning. You need to view your weight training with the same attitude as if you’re an athlete. You wouldn’t play hockey for 2 months and expect to play in the NHL. Josh: I’ve heard you mention a couple times certain benchmarks in terms of strength. How strong does a dude really need to be to get big? Vince: It’s completely relative to the individual. For example, Ronnie Coleman needs to put on 10-12 plates a side just to warm up his legs on a leg press. I only need 3-4 plates a side but still make progress so it also depends on how big I want to get. Your absolute strength is not as important as making gradual increases every 1-2 weeks. I like to see a beginner increase his strength about 5% every 2 weeks for compound lifts until working with 80-100 pound dumbells is common on most lifts. I do like to say, “How often have you seen a guy with small arms or a small back who can deadlift 400 pounds?” Not very often so you should always have a focus on getting stronger. Josh: I’ve also heard you mention “Over Shoot Point” – how does that work? 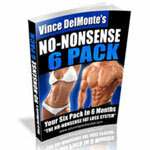 Vince: First off, this advice will apply to about 90% of the ultra skinny guys reading this 90% of the time. it’s when of my most powerful tips to gain weight. I recommend skinny guys over shoot their goal ripped look by about 25-30 pounds before they start cutting. So if you want to be a ripped and shredded 200 pound man then you’ll probably have to bulk till 225ish before you start cutting. You’ll have a substantial amount of muscle mass hidden and when you finally cut the excess fat you’ll look like a new person. Josh: If we watched a guy following your program work out, what do you think is the first thing we would notice, that’s different from what most guys in the gym are doing? 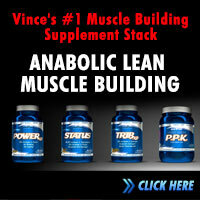 Vince: Gaining muscle weight! Seriously, getting consistent results and they would be having fun. His shoulders would be rounder and traps would be getting thicker. His upper chest would be filling out and his upper arms would be tigher and more dense. If he maintains some cardio and keeps the bulk clean then his waist should stay nice and tight and will not fall victim of the “skinny fat syndrome” that most guys experience when they bulk up. Josh: All the stories and after pictures on your website are amazing. 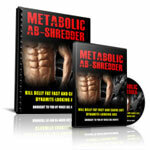 Why do you think people get such phenomenal results with your programs? 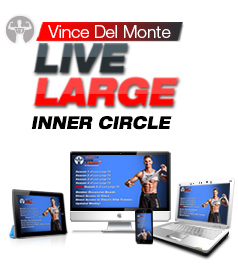 Vince: They are structured and progressive and I provide an online DVD that shows you HOW to lift which most programs don’t do. They are easy to follow and are based on a few of the key cornerstones to muscle growth. The 84-day meal plans are one of the keys too because most guys think they “eat a lot” but are not coming close to being in a anabolic state. 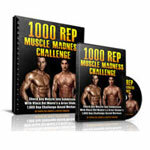 I put the whole package together for my skinny guys so that they are training smarter and not harder. Click this link for more bodybuilding tips. I’ve reticently came across photoshop and i have NO CLUE how to use it. How do i use photoshop to color a drawing or sketch that i’ve made. If not then does any one know where there’s a tutorial in shading, colors, highlights, and basics in coloring an image or drawing somewhere on the net?.